We have a limited number of high quality 4m and 5m Bell Tents available. Our super comfy mattresses and bedding packs can also be booked to ensure the best possible nights sleep. 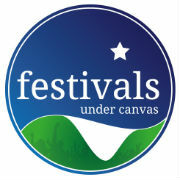 To book or for more info email Bea and Meri at bookings@festivalsundercanvas.co.uk with details of your order. Please use subject line 'Just So 2019'. Please note: Beds are NOT included as standard and need to be ordered separately (you can also bring your own). Sheeted airbeds: bring your own and we will lend you a pump (just ask). To book: email Bea and Meri at bookings@festivalsundercanvas.co.uk with your chosen options using the subject line 'Just So 19'. We will send you an invoice - payable by BACS or paypal to secure your booking. Please include a contact phone number for the booking. Book a yurt before 3rd July and benefit from a split payment system - pay 55% to secure the yurt booking now. The balance will be due on 16th July 2019. 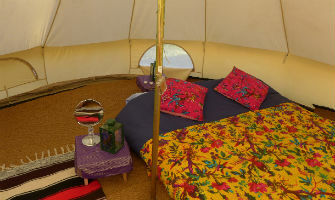 Bell tent bookings require 100% payment up front. Bookings are made with our sister company Festivals Under Canvas Ltd.
Tel: 07852 333 007 (please call during office hours). You have 14 days from date of booking to change your mind for 100% refund - applicable only to bookings made before 3rd July 2019. Bookings made from 3rd July 2019 are non-refundable. We strongly recommend that guests take out holiday insurance to cover their booking in the event that they need to cancel in unforeseen circumstances. We are only able to offer refunds within 14 days of the booking date.